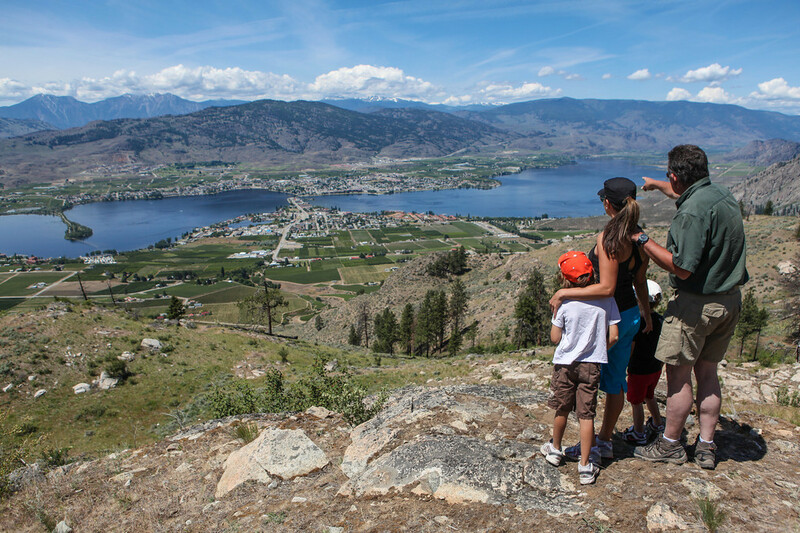 Hiking the hills around Osoyoos is a major pastime for locals and visitors alike. 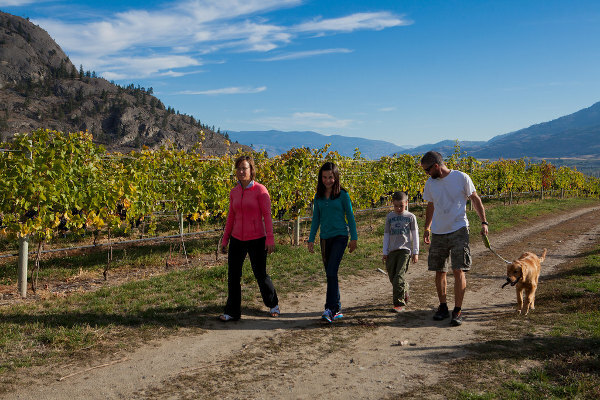 Around Osoyoos, for example, you’ll find a terrain that varies from easy strolls along the shoreline and along the Okanagan River to more strenuous climbs on nearby Mount Kobau where you’ll find yourself atop a rampart that separates two ancient river valleys. It’s worth the hike to find yourself among wildflowers that bloom on the slopes between the sage and pine, looking down on orchards, vineyards, wetlands, and grasslands. And at night, stargazers are in their element. Drive up the mountain, set up your telescope (if you have one) and be dazzled by the brilliance of the stars. Several trails throughout the area provide interpretive signage or guided tours with opportunities for bird watching and wildlife watching, with panoramic views. And, if you’re a birder, bring your binoculars for seeing some of the 300 species found throughout the Okanagan – two-thirds of which breed in our area. The best hot spot to viewing is at South Okanagan Grasslands Protected Area around Kilpoola and Blue Lakes, the Osoyoos Oxbows wetlands and the Golden Mile Trail north of Osoyoos. Among the species, depending on which habitat you’re at, are great blue herons, woodpeckers, raptors, warblers, white tailed ptarmigan and the boreal chickadee. Cyclists come to us for high road, back road, off road, mountain and BMX biking adventures. Many top-end athletes come to us for endurance biking, which you’ll find in several locations. One of the most popular – and difficult – is the road up Anarchist Mountain, a straight up the mountain test that puts the heart rate up and muscles straining. Once you get to the top, you’ll have one of the most spectacular views in the entire region. 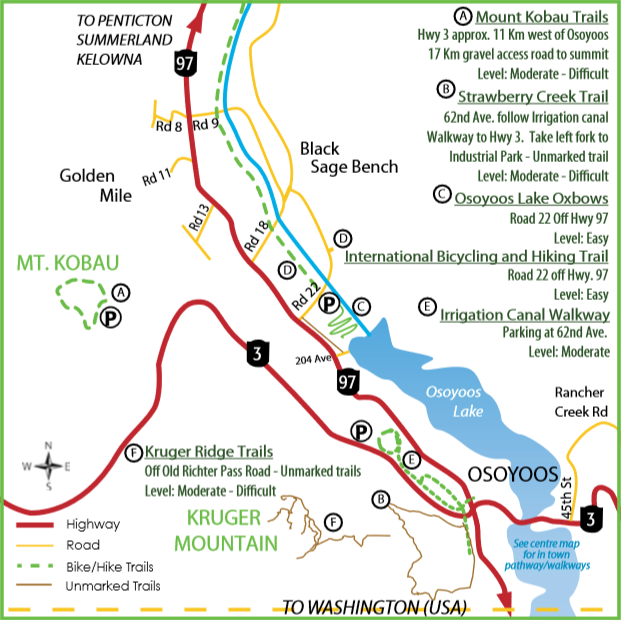 More gentle cycle tours can be found on Black Sage Road and the International Hike and Bike Trail. Take the Black Sage Road, north of Osoyoos, and pass dozens of small and large wineries including Desert Hills Estate, Burrowing Owl, Black Hills Estate and Church and State Winery, among others. Stop in at one or two, have lunch and experience this exceptional industry. The 18 km (10mi) and generally flat International Hike and Bike Trail borders the Okanagan River Channel and like the Black Sage Road route, passes wineries and fruit stands. The first of these two public lake shore parks is along Main Street, the second on Cottonwood Drive. Beautiful gardens change with the seasons. Easy short strolls with benches, picnic tables, public washrooms. Wheelchair accessible. This paved pathway starts at the public beach access where the road makes a sharp left turn, then runs parallel to the roadway and next to the waterfront. This is an easy familiy biking route for those staying in RV campgrounds along Lakeshore Drive. This popular 12 kilometer round trip trail is accessed on 62nd Avenue just north of Osoyoos Secondary School. Parking is available around the corner adjacent to the trail sign. The walkway can also be accessed from the Visitor Centre parking lot. This trail follows an abandoned section of the irrigation canal, once the lifeline of Osoyoos that opened up the area for the fruit industry. Flat with hard surfaces, ideal for easy strolls and strollers. Located within Swiws (formerly Haynes Point) Provincial Park, this easy 1.5 kilometer gravel trail is designed for bird watchers and other nature lovers. Pathways, a spotting tower, boardwalks and interpretive signs will heighten appreciation for this precious wetlands area. 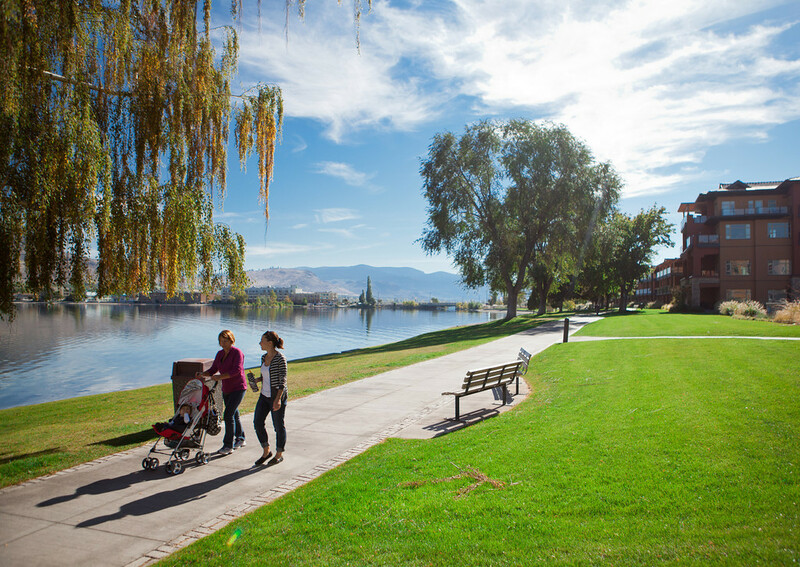 Located at the north end of Osoyoos Lake and running parallel to the Okanagan River channel, this 18.4 kilometer trail is perfect for biking between wineries, fruit stands and farms. The parking lot is accessed on Road 22 off Highway 97, eight kilometers north of Osoyoos. Recently restored, the oxbows at the north end of Osoyoos Lake are ideal for watching both migratory and resident birds. Access at the same parking area as for the International Hiking and Biking Trail but head south instead of north. Located next to and as part of the Haynes Lease Ecological Reserve. The five kilometer Testalinden Trail has oustanding views of the Similkameen and Okanagan Valleys. Access via Highway 3 approximately 11 kilometers west of Osoyoos, then 11 kilometers along the gravel/dirt access road (not suitable for low clearance vehicles) which takes you within one kilometer of Mt. Kobau’s summit. Follow the trail to the forestry lookout for a great view of the valleys and mountains. Please note that the Kruger Ridge and Strawberry Creek trails are unmarked. Please see the map above for locations.